this pack is great mate will you do some for office XP and other programs too??????? Only a few contol panel Icons are changeable. I think i have all the supported Contol panel Icons done. Hey mormegil these icons rocks ! THIS ICONS PUTS ALL AUTHORS ICONS DOWN ! Paul you are a great artist, I love this icon package so much. I have a question though, In the Icon Packager Sets, there are total 100 icons correct? or more? so which is bonus icons that i need to download, in order to complete the package. Thanking you in advance. fall in love with this! I can't install this package. mormegil u r VERY VERY VERY VERY VERY GREAT with ur icons!!! I LOVE THEM ALL!!! 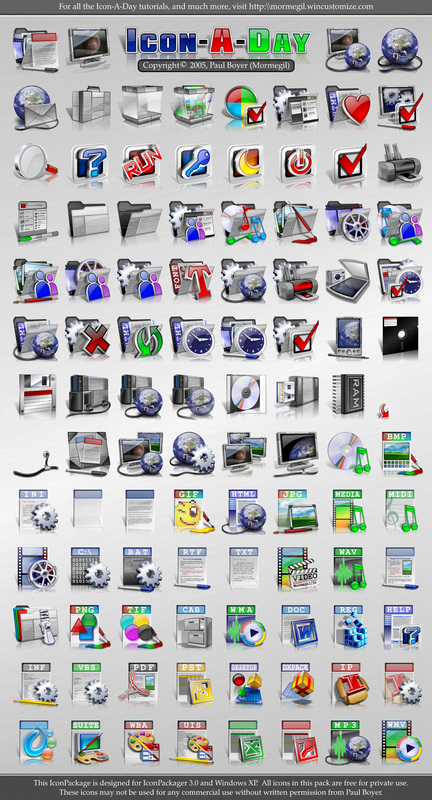 hopefully u can create bonus pack for iconaday tat includes some icon u "missed" like wmv file, real player file, font file etc...ty very much... however, u r incredible!!! I just LOVE this icon package! Compared to this, the default Windows icons look awful. Please check your stardock email. I wish to speak with you about an upcoming software project I am working on. Your artistic skills are superb. Excellent work on these icons. Hail Lord Mormegil.